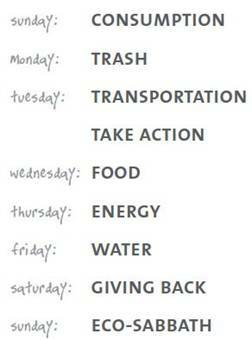 So, I signed up for No Impact Week, Colin Beavan’s national one-week carbon cleanse with YES! Magazine. How did it go? Did it lead me to a happier, healthier and more responsible life? Sunday: Do more with less – so that meant not buying new stuff (except food). Check out the short video The Story of Stuff. Monday: Hold on to your trash to see just how much you create, and what disposables you can reduce. Tuesday: Switch from mechanized travel (planes, subways, taxis, cars, not even elevators) to “active transportation” such as biking, walking, scooting, rollerblading, skateboarding, etc. Wednesday: Look at your food purchases and opt to cook and eat using local and seasonal ingredients. Thursday: Live without electricity – watch out for the candles! Friday: Save water. Every flush counts! Turn off running water! Drink tap!